Would you like some quick and easy Christmas projects where the designing has been done for you? Here's what I currently have still available. 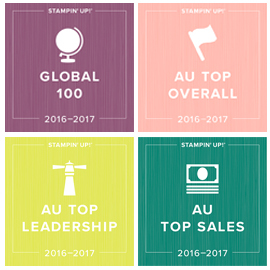 The projects are based on the Stampin' Up! Lots of Joy stamp set which is a great versatile stamp set (available to purchase in my online store HERE for clear-mount or HERE for wood-mount). You could still use the kit and substitute your own stamp set. Mossy Meadow ink pad and either Old Olive or Pear Pizazz as a contrast is optional. I have also used the In Colour Washi Tape (Item 138382) but you could easily use bits of the included patterned paper. The Christmas Tree punch (page 167 in Annual Catalogue) is also optional. It would only be used for the stamped trees. You could cut around these instead if you wanted. The glimmer trees are all pre-punched for you. Kits are only available to Australian residents. Christmas Tutorials available for instant download. As well as buying just the instructions for the above stamp-a-stack, I also have some other Christmas Tutorials available in my Tutorial Store for instant download. The Circle Card Thinlits are in this week's weekly deals, and that's what I used to make this extended Christmas card which has 10 different panels and 4 large circles to decorate or to allow you to add pictures, a family Christmas note and greetings. This tutorial is just $5.00. I LOVE notebooks and journals, I have a zillion of them :) I especially love giving them a personal touch which is what I have done with todays Stamping and Blogging sketch, SB93. 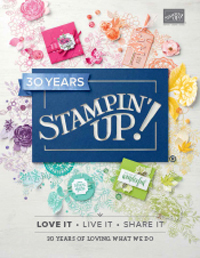 Love this awesome quote stamp in the Stampin' Up! Set Hello Life in the 2015 Occasions Catalogue. I think it's perfect for a DIY/handmade journal, don't you? For the background stamping, I just very randomly inked my background stamp with Crumb cake ink and applied uneven pressure as well. Love the haphazard effect it gave, as it contrasted nicely with the brighter colours. The little flag pieces are actually bits from the Saleabration Project Life mini cards. You can check out all the products I have used at the bottom of the post. Here is the sketch we had to work with this week. Sandi has done such a fabulous job with our sketches. Now it's time to visit all the other Stamping and Blogging design team ladies around the world. Such a lovely bunch of talented demonstrators. I am so grateful for their friendship and inspiration. It's been a while (as you will see in the photos!) 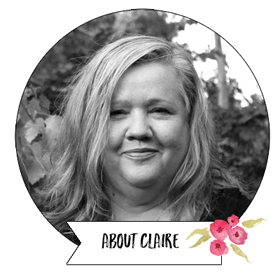 but recently I made a mini album of memories from my 40th birthday using the Mini Memories Simply Created Album Kit in the Stampin' Up! Occasions catalogue. There are a few printed pages, as well as more neutral and natural kraft pages. This page shows the doily and printed kraft bag that is part of the kit. I added the lace and sequin trim. There are also some printed vellum pages. I stamped some die cut top note shapes for extra journalling spaces. I hope you like this little peek at my 40th birthday album. I really love this cute mini album kit and have already purchased another one for another project. It's just $23.95 and you can buy it online HERE or by email. Want to learn new ideas with step by step instructions, get 3 free projects and a minimum of $50 free product? 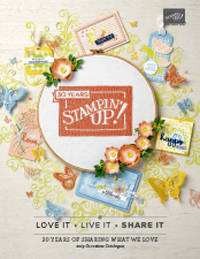 Join a 'by mail' hostess stamp club for VIP treatment. Next one starts soon and all the details are HERE.